To say that caregiving was difficult is no grand revelation. In fact, it’s a grand understatement. I’ve written about it and will continue to do so, to share what the experience is like and to sort through my feelings, with the hope that it will comfort, inform, validate or inspire others. Since ALS is a rare disease, I feel especially compelled to share with people what is involved in this disease, sometimes from my perspective, and when I can, from what I observed about Ben’s perspective. My most profound revelation has been that as much as I lost myself while caregiving, I was also the most myself. In bereavement support groups, I found that some participants could not get far enough away from caregiving. They were concerned about pursuing new relationships for fear of having to be caregivers again. I understand that, but contrary to my support group friends, I actually missed caregiving. Although, obviously, I would never wish for someone I would become involved with to suffer, I don’t think I would run away from being a caregiver again. Despite the ugliness of disease and the sadness and frustrations, there was something uniquely beautiful in caring for my dad and Ben during their journeys from this world. Although immersed in day-to-day difficulties and unexpected crises, I thrived when I was focused on ways to give them joy, to make them comfortable, to see them smile. After caregiving, I felt like I had no purpose. People said it was time to take care of myself. That might have been a good idea, but I didn’t especially like it. I prefer taking care of others. I did catch up on doctor appointments. I also resumed favorite activities like going to the theater and seeing friends. But, I was lonely and lost. Everything was a reminder of my dad and Ben. I came home and had time to do things, but I had no focus and just floundered. Part of it was grief. I have lost many people close to me, so grief is not a new feeling for me. I have learned to co-exist with it and to integrate those feelings into my life. Despite the emotional roller coaster, I love the good memories and I do not underestimate how fortunate I am to have them. As I began to redefine myself and the world around me, I seemed to cling to my role as a caregiver. True, it was a constant struggle that could be disheartening and maddening, and, in the end, I could not save Ben or my dad. But, it was also deeply loving, giving and nurturing, in a most special and compassionate way. Successfully caring for them gave me an incomparable sense of pride and purpose. Time to think and reflect on the caregiving journey enabled me to embrace that, as confusing as it was. 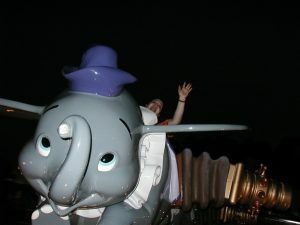 Blogging on Pixie Dust For Caregivers was the way that I started to reconcile my feelings about caregiving and grief. 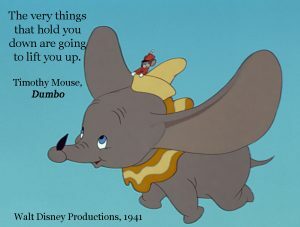 Actually, I had long been collecting Disney quotes for my own inspiration and consolation after Ben’s diagnosis. 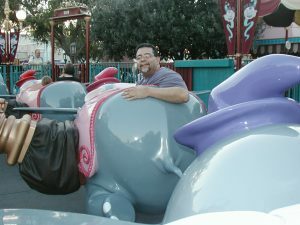 As it turns out, my experiences, combined with Disney things that inspired me, also inform, comfort and motivate others. It is a huge gift to know that. It’s a different kind of caring, but it’s caring nonetheless. On Facebook, there is a group of lovely people who either have ALS or are caregivers of people with ALS. I wish that I had thought to look for this kind of support when Ben was here. I want to be a resource or compassionate shoulder for people if it’s helpful. Likewise, it is healing for to me to hear about the experiences of other people dealing with ALS, as patients or as current or former caregivers, because even a year and a half later, I am still trying to make sense of so much about my experience with Ben. The dialogues in this group are fascinating, thought-provoking, and heartbreaking, but also heartwarming. Twitter (@PixieD4Caring) has also presented a wealth of information and opportunity to interact with other caregivers. I do plan to expand the resources section of PixieDustForCaregivers.com. Caregiving.com offers a certificate program in caregiving consulting. Though I currently focus on my blog and informal interactions, I enrolled in the program and I love the coursework, chat group discussions and strategies for providing various types of assistance and emotional support. I find that it informs my writing and direction. Other students in the program are embarking on wonderful projects as well. Through the certificate program, I was invited to be a presenter in a virtual performance on the stages of caregiving. Click here to watch this engaging and interesting video. I also encourage you to visit the web site to learn about the certificate program, and to discover the vast number resources available there. I am grateful to have kept in touch with some of the people who helped Ben. In talking with the social worker from my local ALS Association, I learned that their office conducts some events for children who have a parent with ALS. As hard as it is to comprehend ALS as an adult, I cannot even fathom how a child processes watching a parent succumb to the disease. I was eager to participate in bringing some joy and fun to these children. I volunteered to work with the ALS team to create craft activities for a kids day event for young children. It was a perfect fit for me, because my background is in arts education administration, which has always been my personal and professional passion. In fact, I met Ben when we worked at The Little Orchestra Society, where I was the Director of Education and planned many workshops for kids and families. Ben was responsible for finance and technology, but he was great with children and he liked to help me out. The kids event was last weekend. It was a small group of children, which was nice and intimate, and the children decorated memory boxes and beaded friendship bracelets. They also drew and painted and explored the craft supplies at their whim. They ate pizza and ice cream and sang along to some Disney music. There was no talk of ALS among the kids, except for one child who asked me if everyone there had a daddy in a wheelchair. It was an afternoon of undivided attention and a fun time in the midst of a difficult period in their lives that they might not even be able to fully articulate. Even the moms participated. They talked amongst themselves a bit about their husbands and situations, and it is a great opportunity to talk to someone also immersed in caring for someone with ALS, even if the progression varies, as it often does. I realized, from the looks on their faces that when I told them that Ben had passed away, that I was also giving them a dose of reality and the future that they may not have wanted to see. On the other hand, although it took time to reach this place, and I’m changed in some ways, I’m here, I’m smiling, I’m still full of love and I want to help. 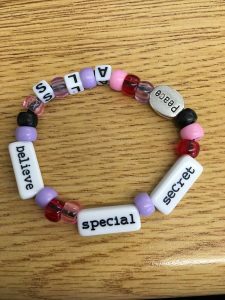 During the workshop, I made myself a bracelet, including words that a couple of the girls chose for me. I added “believe” and “ALS.” “Special secret” is just that, so I won’t tell! “Peace” may have been a somewhat random selection from an emergent reader, but it’s meaningful to me because I wished for it for myself and for Ben. “Believe” is a powerful word for me because it encompasses magic and faith and hope that wishes will come true. I left the event feeling so positive, but also emotional from the combination of excitement of a successful event but the heartbreak of what the families are experiencing, and my own memories. I volunteered to work on more of these events for children and I hope to see these children again. It turns out that, for me, sprinkling pixie dust on others- giving support, compassion, joy and comfort- is very healing pixie dust for me! “Heigh-Ho, Heigh-Ho” A Caregiver’s March? How Does a Moment Last Forever? I commend you on your commitment and wonderful activities and I thank you for showing us the door of acceptance and transformation! Caregiving is often imposed by circumstances, but then it can transform itself into a mission, the one that enhances and can change lives…And you are the living proof of that! As a longtime caregiver myself, I’m still behind that closed door, but reading your essays does help me to ease my pain, as well as to look at the future with renewed hope. I really enjoyed reading this and how you’ve found your strength through your caregiving journey. This is a beautiful piece. I love your page. Thank you so much for your very kind words. It makes me so happy when my words and experiences resonate with others. I hope you’ll come back and share your thoughts.